Torino have completed their second acquisition of the summer transfer window by securing the signature of Swedish midfielder Alexander Farnerud from Swiss club Young Boys. 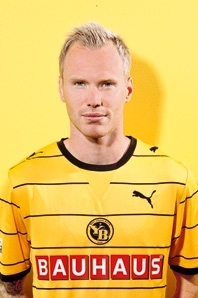 Farnerud, who has played for Strasbourg, Stuttgart and Brondby earlier in his career has also played eight times for Sweden scoring two goals, although he has not received a call up since 2010. In other news, Torino have renewed the co-ownership deal with Udinese for Paulo Barreto, whilst they have also purchased the other 50% of Alen Stevanovic from Inter. Despite a disappointing end to the season, Torino did manage to achieve their aim of avoiding relegation this season, and a number of excellent goals were scored by Torino players. Watch the video below, and then vote for your favourite goal on the poll. Competition will run for a couple of weeks, or until I remember to take the poll off the website. Enjoy. Now that the dust has settled on the 2012/2013 Serie A season, the time has come to recap the season from a Torino viewpoint, and what better way to do that than with a series of end of season awards. I'm sure there will be some disagreements regarding my choices, but feel free to share your own thoughts in the comments section below. In past seasons the 'Player of the Season' award has been put to a public vote with the readers of the blog being able to have their say, but after this campaign that seemed to be a little futile, with Alessio Cerci being the only candidate to win the award. The winger arrived from Fiorentina in the summer with a reputation as being a talented but frustrating player, but after a number of outstanding performances in a Torino shirt, Cerci has been rewarded with international recognition and he is likely to be included in the Italy squad for this summer's Confederations Cup. His tally of eight goals and as many assists was essential in helping Toro avoid relegation, and he is now inevitably being linked with a move away from the club. The Granata had an unfortunate habit of being on the losing side in entertaining games this season, and that was probably best illustrated in an end of season game against the Viola in April. After going 3-0 down within thirty-three minutes, Torino showed some great character to score three excellent goals and looked likely to earn a deserved point. However, after throwing away a chance to win it themselves on the counter attack, they were made to pay moments later as Romulo scored a dramatic late winner to break Toro hearts. Other games that could have easily won this award were two more Toro defeats, Cagliari 4-3 Torino and Torino 3-5 Napoli, but in my opinion this game was probably the most dramatic of the three. Back in January, with Torino leading relegation rivals Siena 3-2 in the closing stages, the away side were awarded a controversial penalty in front of the Curva Maratona. Former Torino captain Alessandro Rosina stepped up to take the spot kick, and given his excellent penalty record that he enjoyed whilst he was with the Granata, I don't think anybody expected him to miss. But incredibly, Rosina put his penalty wide of the post, and Torino held on for what turned out to be a crucial victory. After his performance against Inter at the San Siro in January this season, the belief that Riccardo Meggiorini was only able to score against his former club was increasing amongst Toro fans. Meggio had gone into that game without a goal all season, but he scored two well taken goals to put the Granata on the verge of a historic victory - but like so often this season, they had to settle for a point instead. To be honest, this is just an excuse to ensure that Rolando Bianchi ends his final season Torino with some (albeit meaningless) silverware. Bianchi had a habit of passionately celebrating all of his 77 goals for the club, but even by his standards, his reaction to equalising against Roma was something special as he took off his shirt and raced around the pitch. This is arguably the most controversial choice considering he was undoubtedly being fouled at the time, but Jonathas had the chance to make himself a Torino legend in the 80th minute of the derby against Juventus with the scores level. However, he was unable to get a touch on Alessio Cerci's low cross, and as we know it proved to be decisive as Juve scored two late goals to get yet another victory over Torino. I will be doing the traditional 'Goal of the Season' video compilation in the next few days, and this goal doesn't make the cut, but on a personal level I felt it needed to be mentioned. The reason for this is that Birsa's somewhat scruffy goal is actually the first 'winning goal' I have ever seen a Torino player score live, as I finally managed to end my seven year wait to see a Torino victory.